The 2018 “Brimmer Laboratory” Auction was a great success, raising over $100,000. Funds raised will support Lower, Middle, and Upper School Financial Aid and Professional Development. Thank you to Auction bidders, donors, volunteers, and supporters who made the event extremely successful! Thank you especially, to the Executive Auction Committee, Jessica Purdy, P '23 '26 '28 '31; Erika Siegal P '24 '25; and Tonya Mezrich P '28 '30, and to Auction Committee for creating a phenomenal night for Brimmer. 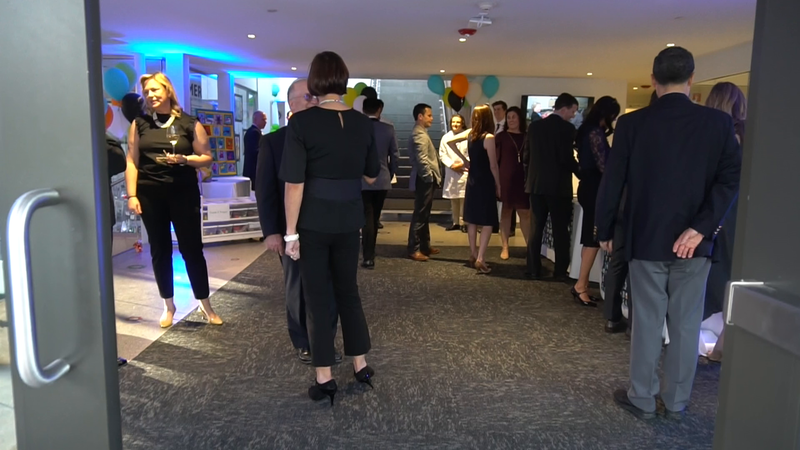 The Auction was held on campus with “Laboratory” cocktails served in the Innovation space and dinner served in the new—and transformed for the evening—Corkin Family Dining Commons. Gasses bubbled out of glass beaker centerpieces, bright balloons adorned the room, and wait staff dressed in very official white lab coats. The energy in the room was fantastic, and Auctioneer Bill Jacob did a phenomenal job keeping the bids coming in as he entertained the crowd! Alumni Megumi Milla '12 and Diana Chaves ’12 both spoke from the heart as they described what their Brimmer experiences meant to them and how the School has helped shape them. The night was a great event for a very worthy cause, and we could not have done it without the support of the Brimmer community. Click here to view/order Auction photos by our professional photographer, David Barron.